I had some bananas going begging, this week, which just demanded a recipe for banana bread. Daughter #2 was particularly fond of this loaf. 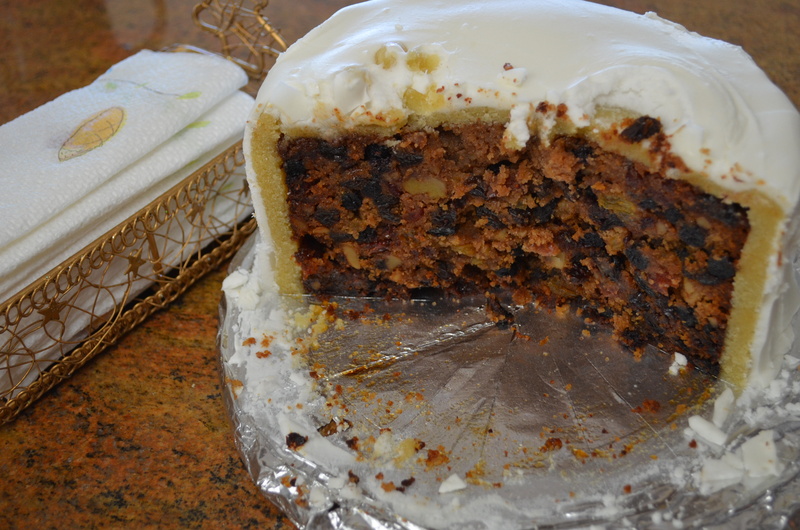 It has a distinct banana flavor, and is moist and vaguely sweet, with more densely sweet pockets provided by the dried fruit. It slices well, and it’s also extremely easy to make! In a food processor, beat together the sugar and margarine. Add the eggs one at a time, and process until combined. Sprinkle the rest of the ingredients (except for the raisins/walnut pieces) over the egg mixture, and process to combine. Add the raisins/walnuts, and process for about 5 seconds (or by hand) to combine. Turn the mixture into two 1lb loaf pans greased or lined with baking parchment. Cook for 60 minutes at 350F on the middle shelf, or until a toothpick inserted into the center of the cake comes out clean. Variation: Instead of baking in a loaf pan, smooth the batter into a silicone flan pan (same cooking time), and when the cake has cooled, fill it with bananas and custard made with 2-3 bananas. GF Banana Bread flan case topped with bananas and custard. Although I’m more focussed on savory meals, it does seem wise to have at least a handful of trusted recipes in my repertoire for sweet indulgences. This makes about 24 two inch cookies. Blend together the margarine and sugar in a food processor (or by hand with a wooden spoon, if you’re still that virtuous) until fluffy. Add remaining ingredients (except chocolate chips), and process into a coherent ball. Add a tablespoon of rice milk, if needed to get the dough to come together. Stir in the chocolate chips, and put 1 tbsp quantities onto a parchment lined cookie tray (9 – 12 per tray), then roll gently to 1/2″ thickness with a rolling pin, or flatten with the back of a wetted spoon. Cook in the top half of the oven for about 15-20 mins until barely golden around the edges. Remove from the pan, and allow to cool. It had to be done. 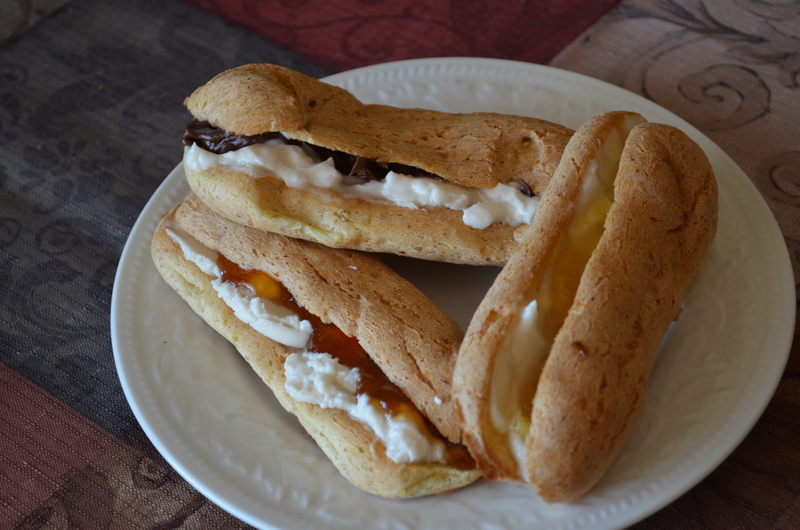 After making the gougeres, I just had to have a go at adjusting the recipe and making eclairs. These are slightly sweet, moist, soft, light and airy, but with a slight bite to them, and not very bread-y at all. Their flavor is pretty mild. I allowed mine (well, some of them) to get cold before slicing them, and filling with vegan cream cheese and something sweet. They disappeared rather quickly after that. Sliced, and filled with vegan cream cheese and apricot jam / blood orange marmalade / chocolate spread. Put all the dry ingredients in a bowl, and mix briefly with a wooden spoon. Put the vinegar, water, and margarine in a small saucepan, and bring rapidly to a boil. Remove the saucepan from the heat, and immediately shoot in the dry ingredients and stir maniacally with the wooden spoon for about 30-60 seconds, until the dough thickens and smooths out somewhat into a ball. Allow the mixture to cool for a few minutes so that the eggs you’re about to add don’t turn into scrambled egg. Now, using a hand held electric whisk, incorporate the egg, one tablespoon at a time. At first, the mixture will soften and start to look like soft scrambled egg; then it will get thick and start to clog up the beaters (don’t worry; just soldier on). After more egg has been added, the mixture will start to soften so that it comes out of the beaters so it can be beaten more effectively. Stop adding egg when the mixture becomes like cake batter (somewhere between 3 and 4 eggs). 3 eggs will give a thicker mixture with fewer holes; 4 eggs will give a thinner mixture and a finished product with more of the holes characteristic of pate a choux pastries. Line a baking/cookie sheet with baking parchment (or grease). You can either use two teaspoons (one to scoop, and the other to push the mixture off the other spoon) to form small balls, or scrape the mixture into a piping bag (or freezer bag with the corner snipped off – with a hole length of about 1/2″), and pipe the mixture into thick 5″ long stripes to form the traditional eclair shape. When you’re ready to cook the pastries, preheat the oven to 400F. When hot, place the cookie sheet in the center of the oven, and cook for 15 minutes. Reduce the temperature to 360F, and cook for a further 15 minutes. Remove from the oven, and pierce each pastry with a wooden cocktail stick in order to let out the steam. Allow to cool, then slice, and fill with vegan cream cheese and something sweet, or coat with chocolate. For such unassuming ingredients, these make remarkably well received biscuits (Am: cookies). Well known to Brits as a slightly sweet, slightly salty biscuit (cookie) often adorned with chocolate, they aren’t frequently found this side of the pond. I can’t say I’ve ever seen them commercially in gluten free format. Normally, if they’re not smothered in chocolate, they are good with cheez, or cream cheez and a dollop of jam. They are also traditionally dunked in cups of tea regardless of chocolate status. Just don’t make them while under the illusion that they’re a health food! 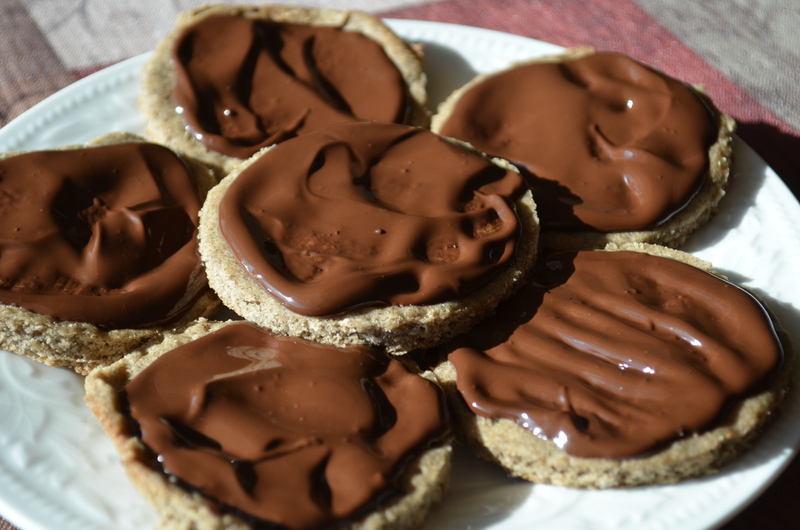 Digestive biscuits coated with dark (dairy free) chocolate. When they first come out of the oven, they will still be soft, and you’ll have to wait about 15 minutes while they cool and crisp up. I have a problem keeping them around for long enough to do that here, and my husband reckons they could be rolled 1/2″ thick so they stay soft. 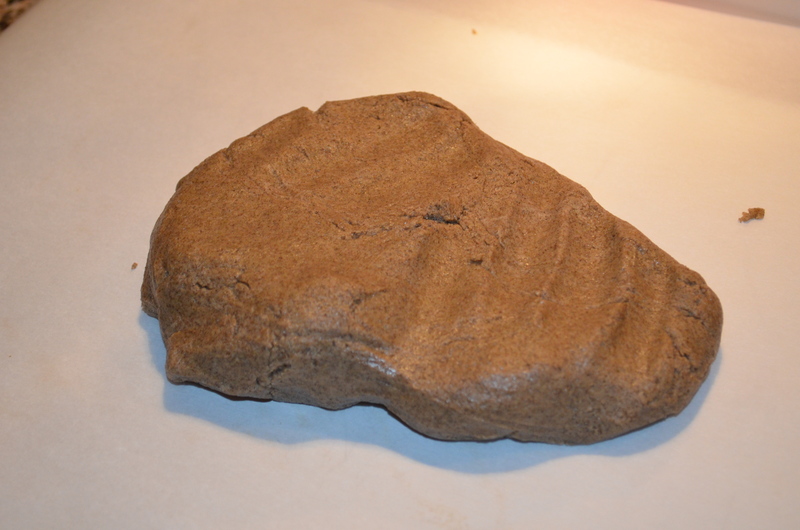 Yes, they’re good like that, but I was trying to make digestives! Rolling these no more than 1/4″ thick allows them to crisp up as they cool, so they have a satisfying snap. I recently had an epiphany regarding the preparation of these treats. I realized that if I turned my cookie sheet upside down, I could roll the dough out to the size of the sheet (between the pieces of parchment paper) without bumping into the raised edges. If I then used a cookie cutter on the dough, but didn’t remove the excess from the edges, it was easier for me, and folks that wanted to nibble before the biscuits had cooled could do so around the circles, and leave the circles intact ready for proper presentation later on. Preheat oven to 375 degrees F (190 degrees C). It doesn’t take long to make these cookies. In a medium bowl or food processor, cream together the margarine and the sugar. Sift the flours and salt over the margarine, and stir. Stir in the milk until mixture forms a thick paste. Knead dough on a floured surface until smooth (not needed if you used a food processor). Roll out the dough between two sheets of parchment paper to approximately 1/4″ thickness. Remove the top piece of parchment. Cut the dough into rounds with a cookie cutter about 2 1/2 inches in diameter, or just cut into squares with a pizza wheel. Transfer to a cookie sheet (or two) and prick with a fork. Bake for 15 to 18 minutes, or until golden. Do not overcook. Let cool on wire rack. To make chocolate digestives, melt some dairy free chocolate in the microwave, and spread the top of each cooling biscuit with chocolate (with the help of a knife), and allow to cool/set. My husband and girls are off to marshal at a bike race in town this morning. They’ve done so for the last 3 years, and the girls now expect a minor league feast to be provided to protect against the cold, and entice passers by to stop, chat, and share. This year the feast included mince pies, individual carrot and raisin muffins, fruit scones, pizza, and these Bakewell tarts, along with 4 Thermos flasks of hot chocolate, coffee, and tea. As you can imagine, I spent all of yesterday afternoon cooking gratuitously. I remember enjoying Bakewell Tarts when I was a child. Pastry encrusted tarts filled with a smear of home made jam, topped with a moist almond flavored cake layer. I don’t think I’ve seen them since we moved state side of the pond, but of course commercially prepared ones would be totally unsuitable for me to eat these days anyway. Traditionally, the jam included should be raspberry, but since I really dislike pips, I sieve it if I use raspberry. 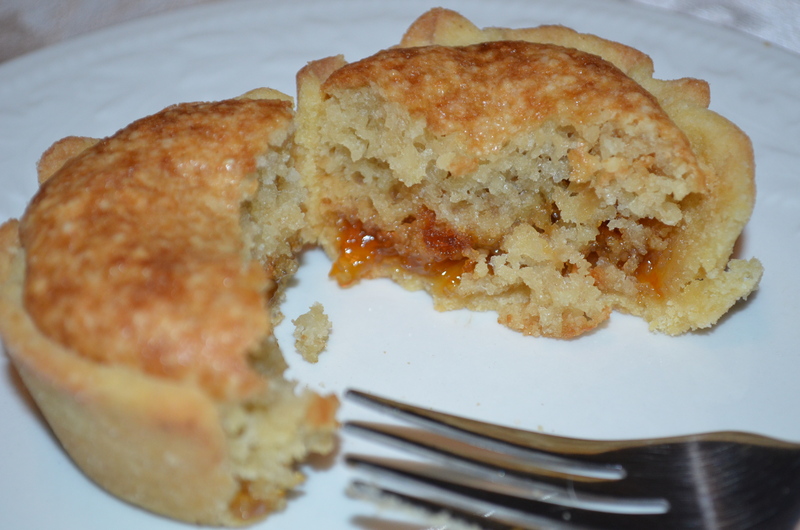 However, since I don’t have raspberries in my garden, and I do have apricots, I used apricot jam for the tarts pictured here, and no sieving was involved. This recipe makes 24 individual pies. Heavily grease 2 muffin trays (for 24 muffins). Roll out the pastry to about 1/4″ thick, and use a circular cookie cutter to cut out circles and use to line the muffin tins. In the bottom of each pastry case put 2 – 3 tsp jam. Break the eggs into a large bowl (food processor works) and beat for 30 seconds (or with a large whisk for about 2 minutes) until the eggs have turned a pale yellow and frothy all the way through. This doesn’t come out right unless the eggs are beaten first. Add the sugar and beat for another 20 seconds (or a little longer by hand), then beat in the margarine. Sprinkle the rest of the cake ingredients over the egg mixture, and either beat until they have been incorporated (10 seconds plus a scraping down in the middle), or fold in by hand with a large metal spoon. Top the jam with enough of the almond cake mixture to fill the case 2/3rds of the way up. Place 2 or 3 almond flakes in the middle of each cake, for decoration. Cook in the middle of the oven with a sheet of foil on the rack above to protect from over-browning for 40 minutes at 360F, or until the cake mixture has cooked (and a toothpick inserted into the middle comes out clean). a) I generally don’t want to have more than 1/3 of the flour in a recipe represented by starches or rice flour. b) The intervals between experiments have to be quite long so that I don’t put on too much weight. My husband says that scones aren’t supposed to be health food, so I should stop fretting about the starch, but it goes against the grain (so to speak) to just completely give in, on the health watch. After six different variations on a theme, I finally came up with this recipe in which I relented and included brown rice flour. The brown rice flour and starch ended up accounting for 50% of the flour mixture, so not as bad as some of the recipes out there, and the almond/flax/coconut flours are pretty good nutritionally. The 3/4 cup of sugar that I included makes the scones vaguely sweet, but you can reduce it to 1/2 cup if that suits you better. These scones are moist, not-starchy bland, and sturdy enough to spread with margarine or vegan cream cheez and jam, without disintegrating into a pile of crumbs. 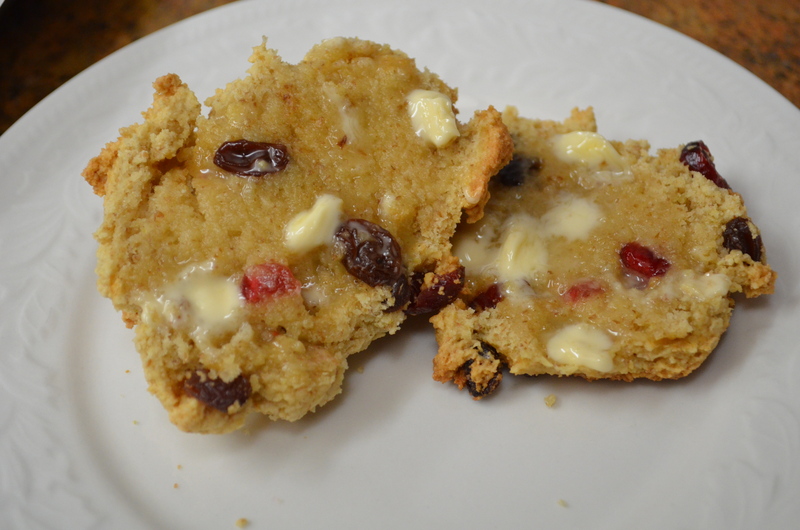 You can cook them up in a single large scone, and cut into wedges to serve, or make individual scones. Note that they don’t rise much after the processing, so to retain their lightness, avoid compressing the mixture while turning it out onto the baking sheet. I’m now here hoping that the rest of the family will get back from being out, before I eat the lot! Combine all flours and the margarine in a food processor, or rub in by hand. Add the remaining ingredients except for the dried fruit, and process (or mash with a wooden spoon) for about a minute until the coconut has absorbed the milk, and a soft dough has been formed. Line a cookie tray with baking parchment, and spoon the dough into 12 individual scone piles, or one large round ~1” thick. Cover the scones lightly with a sheet of parchment paper or foil to prevent over browning. Cook for 30 – 35 minutes at 350F. Allow to cool for 5 minutes to allow structure to set, then serve warm, cut in half and spread with margarine or cream cheez and jam.